Chocolate: Sweet. Rich. Satisfying. Can you imagine life without it? But what does it mean to live a chocolate life? It means experiencing everything from bitter nuggets of pain to sweet morsels of joy, from dark and lumpy to light and smooth. Whatever the shape, flavor, or texture of your days, you can live in the rich and endless supply of the grace that is ours because of Jesus. Are you ready for a treat? 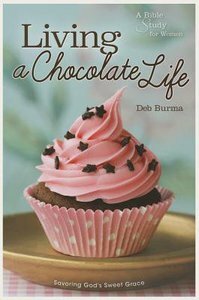 The eight chocolate-inspired lessons in this study focus on different aspects of life as a Christian woman, reminding you that you are wrapped in God's love. Each lesson includes a recipe for a chocolate dessert, a Bible verse to memorize, chocolate fun facts, a suggested group activity, encouragement for life application, and a prayer. For groups or individuals. Each session is designed to last 45 to 60 minutes. Answers to study questions included. Book jacket. About "Living a Chocolate Life"